Canadian astronaut David Saint-Jacques tests out the Bio-Monitor experiment, which sends information about an astronaut's physiology down to Earth. A Canadian Space Agency (CSA) astronaut has deployed for the first time a new "smart" jersey designed to monitor real-time changes in its wearer's physiology without disrupting the flow of daily activity. 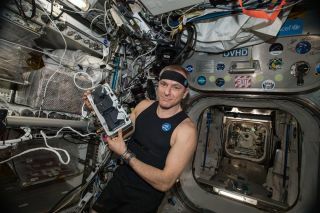 David Saint-Jacques, who arrived at the International Space Station (ISS) as part of the Expedition 58 crew in December, will be putting the Astroskin Bio-Monitor System through its paces over his six-month mission, including during sleep and exercise. Quebec's Carré Technologies, also known as Hexoskin, developed the system for the space station under a $2.4-million Canadian ($1.79 million) contract with the Canadian Space Agency, according to Air and Space magazine. Meant to be portable and unobtrusive, Astroskin consists of a snug, stretchy shirt; a head sensor that looks like a sweatband; and a small recording device that can be tucked into the shirt's pocket. The device also includes apps for iPhones and iPads, data-synchronization software, and a web-based dashboard. Incorporated into the shirt are five wireless sensors that continually measure parameters such as skin temperature, blood pressure, breathing rate and blood oxygen levels in real time. The sensors are powered by two AA batteries, which need replacing every 48 hours for around-the-clock tracking. Astroskin will allow scientists to do away with bulky equipment while recording astronauts' vital signs in a "way that does not disturb daily activities or require lots of time or attention," CSA officials said in a statement. Because an on-orbit controller beams the information collected by Astroskin directly to Earth, scientists are also able to receive data directly for quicker analysis. This will help them better understand the unique stresses microgravity places on the human body, including how it might alter the sleep-wake cycle. Once the device is operational, CSA will make the Astroskin available for the next five years to all participating countries aboard the ISS. The system has potential earthbound applications as well, including for people who are bedridden, housebound or living in rural communities with limited access to health care, CSA officials said. "It can also be worn by workers in dangerous environments such as mines, industrial sites or factories," the officials noted.